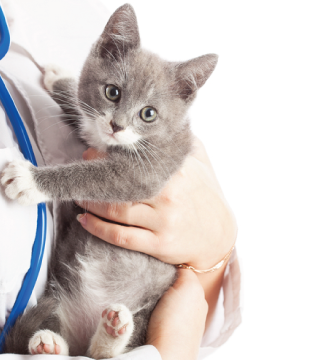 If one of the veterinarians at Advanced Animal Care discovers that your cat has a short term illness, or an ongoing chronic health issue, your kitty may need prescription medication and it will be your job to give it to them. Giving medication to a cat can be challenging when he doesn’t want to cooperate. At Advanced Animal Care, we are here to explain how you can give your cat his medication successfully, without stressing out your feline friend or yourself. There are also long lasting antibiotic and pain relief injectables available. Talk to one of our veterinarians about these options at your next appointment. With proper instruction from our veterinary team, you can be successful at giving your cat his medication. And at the end of the day, you know you’ve done your best to make your buddy feel comfortable throughout his or her healing process. Cats who are hyperthyroid may be given a transdermal gel medication which is applied to the tip of your cat's ear. In some cases this type of medication may be easier to apply for the pet owner. Some medications are available as transdermal gels, meaning that they are applied topically like a lotion, usually to the ear tip. With transdermal gets, it is important to understand the absorption rate and pay close attention to dosing. If you have to medicate your cat for a long period of time, have a game plan. You will want to be prepared with a plan of action. While every cat is different when it comes to taking medications, most cats respond well to positive reinforcement when administering cat medications. You will have a quick window of opportunity to medicate your cat, before he changes his mind. Trying to medicate your cat on the ground is much more difficult and tough on both of you, whereas medicating your cat on a table or other elevated surface makes the job easier for both of you. Most vets have a well stocked pharmacy for their patients. It is best to get your pet’s prescription filled at your veterinary hospital. Some drugs that need to be compounded or flavored have to be made and then either picked up or mailed to you. For refills on medications, call your veterinarian. Your pet may need to have periodic blood work done to make sure he is on the correct dosage of the prescribed treatment. Prescription cat food is formulated for specific health issues your cat may have. There are certain health conditions that will benefit from prescription cat foods. These foods are formulated by veterinary nutritionists. Your cat my turn his nose up at first when you introduce a new food, but if you gradually transition your cat to the new food by mixing it with your cat's old food, they will often accept it over time. If your cat continually refuses the new prescription food, let your veterinarian know and they may have you try a different brand or flavor that your cat may like better. If you think you may be noticing a change in your cat’s behavior, please call our office at Advanced Animal Care and make an appointment. Even the smallest changes in behavior can indicate that your cat is facing a significant health problem and could benefit from veterinary intervention.